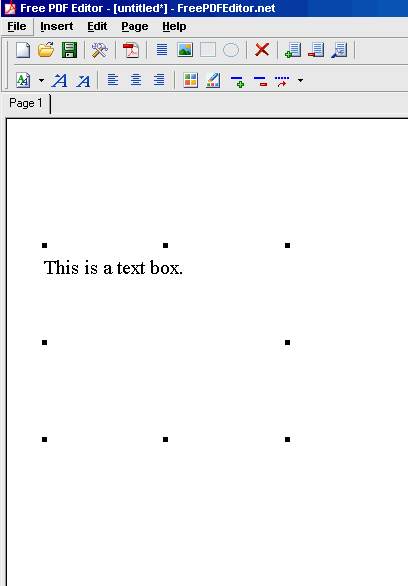 Free PDF Editor allows you to insert text and images into text and image boxes, as well as rectangles and ellipses. Within a text box, you can change font, alignment, size, and color. Useful for creating quick-and-dirty PDFs without having to use OpenOffice or having access to a print-to-PDF program. NOTE: This program merely exports to PDFs and cannot open them. How to extract: Download the EXE to a folder of your choice. Launch FreePDFEditor.exe. As in 2010 year comments, this is not a real editor: it just can't open any pdf file. It shouldn't be included in as a PDF editor. All it is is a rich text editor that 'prints to PDF'. And, after testing this myself, it was not trying to contact a remote IP address at all, and it also works on Windows 98SE (so presumbly on ME as well). 192.88.99.1 is a special IP address related to IPv6 compatibility. If this program is trying to talk to that particular IP address, I think that actually means it's trying to communicate with an IPv6 address and that IPv4 address you're seeing is the 6to4 relay occuring. It tries to connect to 192.88.99.1 IP address after start (no way to control this behavior from settings). Usually this is related to updating, but the report I've got from IPNetInfo is disturbing enough to keep me away. You have to login in order to post comments.